Fluid Service Technologies manufactures category leading, specialty fluid service equipments (Transmission Flusher & Coolant Flusher) for the Fast Lube, independent Service and Automotive Dealership market worldwide. The Coolant flusher flushes the entire system within 15 mintues. It is fully auatomatic once connected and leaves no mess whatsoever. 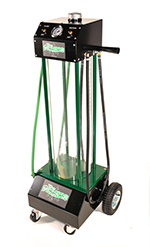 The Tranmission flusher flushes is the fastest machine on the market. No messing around when changing fluid types. Just pour in the required amount of the appropriate fluid. Please select a machine to view our range of parts and accessories.